Hosting a Twitter chat is an amazing way to interact with your fans and followers, to better understand and grow your community quickly, as well as promote your brand and business. I’ve seen the networking and promotional power of the Twitter chat, so I made up my mind to dig deeper. It’s challenging to describe everything I learned in this one article, but I’ll do my best. 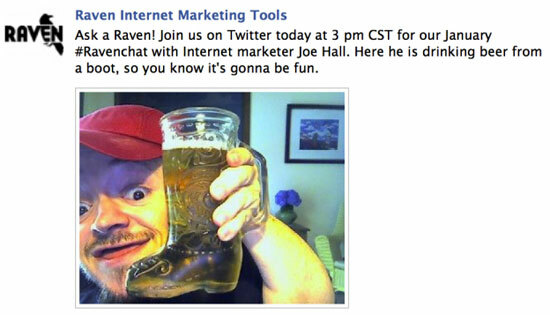 Here’s the all-in-one guide to prepare for and host your Twitter chat. 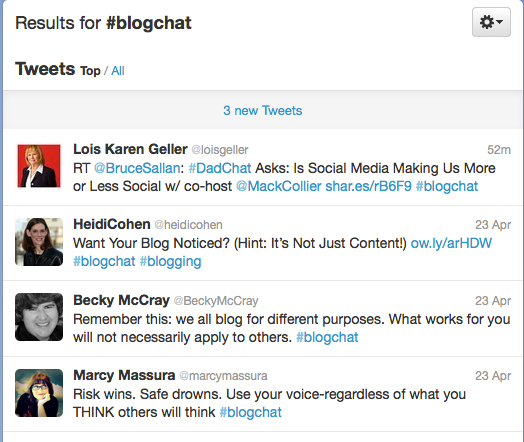 Bloggers connect using #Blogchat hashtag. Promote your social media presence: While Twitter chats evolve around one hashtag, it’s still public—which means millions of followers of the chat participants will see the hashtag and check what’s behind it. This means hundreds of new people learning about your brand each time! That’s a great way to reach more people on social media! Get instant feedback: Twitter chat is a great opportunity to listen to your community. Ask questions and you’ll get answers immediately. Create the community behind your business: A Twitter chat is one of the most engaging social media activities which forms a habit. Your followers tune in weekly at the same time to interact with each other, follow each other, retweet each other, etc. That’s one of the best ways to turn your followers into your brand advocates. Provide customer support. Here are some brilliant examples of twitter customer support courtesy of DirJournal directory. This Google Spreadsheet is the user-generated database of Twitter chats started by Robert Swanwick. To find relevant events, simply use CTRL+F shortcut. I am not sure how actively it is moderated, but it seems pretty clean right now. 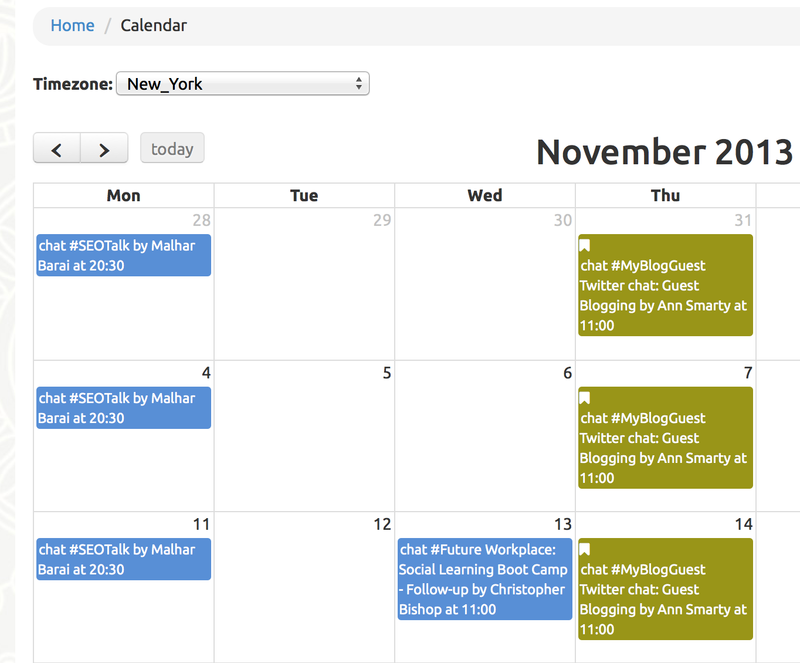 Twebevent is another great tool to track upcoming Twitter chats. The search option seems to be broken, but you can easily go from room to room (or go to the upcoming events) to find an interesting one. After a couple of days of following a few relevant chats, you’re likely to have ideas. Now you can get things set up. Absolutely unique. Search Twitter before picking one (you may also want to search Google and Urban Dictionaryto make sure there’s no fixed or nasty associations with the word you have invented for your hashtag). 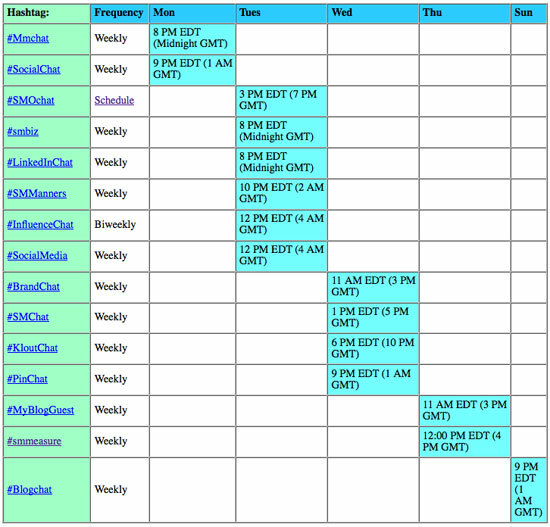 Twitter chat schedule: Major social and blogging Twitter chats. As short as possible. Remember the hashtag will be in each tweet of your chat. The longer the hashtag, the less your chat participants will be able to say! Easy to remember. The hashtag should reflect your topic or brand name to create instant associations. Easy to type. No matter which tool you invite your followers to use, there will always be some who will manually type the hashtag to include the tweet into the discussion. It helps a lot when your hashtag is easy to type. So avoid double letters, symbols, etc. For example, one of the hardest hashtags I’ve come across is #call_team that includes an underscore. It will be hard (although not impossible) to change the time once you start, as this may result in people missing the chats. Use a time that works best. Make sure there’s no major Twitter chat on a similar topic on the day your event is scheduled. Help people around the world to understand when your chat is going to take place (this tool will help you with time zones). Summarize the discussion to keep it focused. …no matter what day and time you pick, someone will say it isn’t the best for them. I am constantly having people tell me they want to join #blogchat, but can’t because it’s on Sunday nights. But sometimes when a holiday or special event falls on Sunday night, I will move #blogchat to Monday for that week. And as soon as I do, some people will tell me that they can’t join because Monday nights are no good for them. So pick the day that works best for YOU, and stick with it. You can’t do it all by yourself. You need people who will help you get your message across. Inviting moderators is a great way to enroll powerful people to work on promoting your event. Moderators can be your team members, the most active members of your community or your close social media contacts. Keep the discussion focused (with many Twitter users contributing, it’s not usually easy to keep the discussion on topic). Promote the chat regularly and invite new members. Summarize different parts of the discussion (mark the end of the introduction part, list tools and resources mentioned, and summarize). Create a short but helpful “static” reference page listing when and how often your Twitter chat is going to take place. Your announcement article should also contain a good explanation of how Twitter chats work (here’s a good one), as well as which tools the participants may use to follow and take part. Make sure that this page ranks #1 in Google search for [official hashtag] so that people can find your event to start following it. A separate page explaining how and when to join a Twitter chat. Allow your followers and brand advocates to promote your Twitter chat by creating all sorts of promotional media such as badges (which are easy to embed and share) and introductory videos. People love promoting contests and events if you give them rich media. 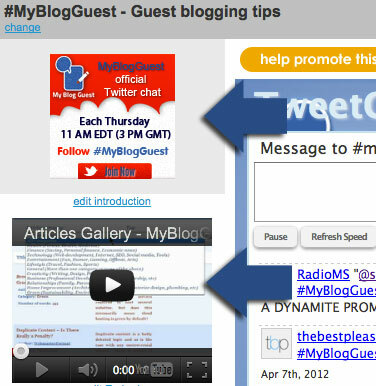 Create embedded media to let your followers promote your Twitter chat. Start with a welcome introduction (a couple of minutes to let your chat participants introduce themselves and begin tweeting about your event). Announce your chat topic (pick one specific idea for each of your chats to keep the discussion focused). Tweet your own thoughts and ideas on that topic. Give at least 5 minutes for your chat participants to share their ideas (retweet the best ones). Summarize the most important points as you go along. Ask questions (label your questions as Q1, Q2, etc., to make it easy for your chat participants to answer and encourage discussion). Retweet and summarize the best answers. Share some related tools and links and invite your chat participants to share their own as well (retweet the best ones). Announce the upcoming end of the chat and thank everyone for participating. Announce the next chat day/time and topic. Close the Twitter chat by announcing what’s planned for the next one. Rinse and repeat next time you have your Twitter chat. Most popular Twitter clients can be used to follow and participate in a Twitter chat using the official hashtag. For example, with HootSuite you can create a new tab to track Twitter search results. Note: This will also *archive* the search results for further reference. TweetDeck is another great option where users can add a new column for the hashtag results and get desktop notifications of the new tweets. Your chat participants can pick their preferred method if they know the hashtag; however, it’s useful to link to only one option when you invite people to join the chat. 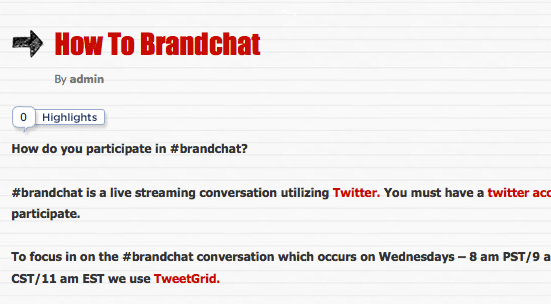 Your chat participants will need to authenticate Twitter to be able to tweet right from TweetChat. 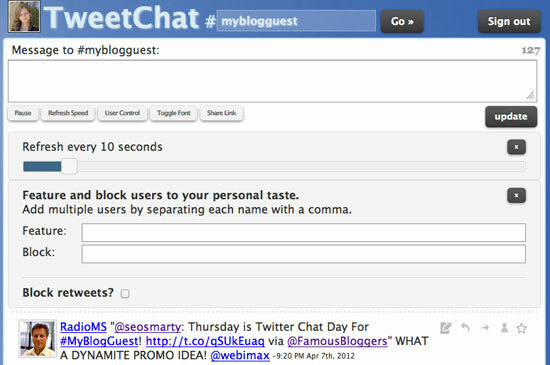 They won’t need to type your hashtag—TweetChat will add it automatically, which makes the process much easier. TweetChat is a bit slow in terms of updating the tweets. You can set it to a 5-second update interval but, in my experience, people who are using TweetChat are generally slower than those on TweetDeck. This is not that crucial if you structure your chat well and give everyone a couple of minutes to follow up. Tweet to the chat without typing the hashtag (as well as retweet and favorite others’ tweets within the chat). Adjust the refresh speed (5 seconds is the minimum available). Filter out retweets (to remove any clutter). TweetChat option: adjust the refresh speed, filter out retweets, and follow the chat. There are various tools that let you create transcripts of your tweets, but you are likely to find the resulting transcripts quite overwhelming (with many people tweeting and retweeting updates using your hashtag throughout the chat). Storify is the best option to create transcripts of your tweets because it lets you pick the tweets you want to be in the transcript and add some essential context for the tweets you choose. On top of this, Storify lets your Twitter chat users subscribe to any new “chapters” you publish (which results in even more content exposure). To pick a tweet, double-click on it in search results. Hover over the added tweet and click “Add text” to add some additional context to the tweet. Enhance your story with YouTube video, Flickr images, embedded links, etc. 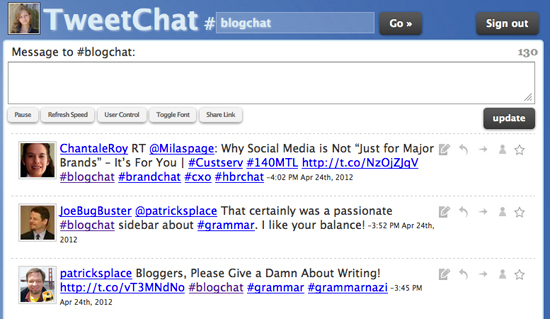 Use Storify to create rich transcripts of your Twitter chat. Twilert will email you the list of tweets containing your hashtag. The resulting email update looks nice and is very easily blogged when you are on the go (you can update your blog as well as your Facebook page right from email). It will also create a searchable archive of your Twitter chat in Gmail (use Gmail labels to send them all in one specific folder for better organization). SearchHash lets you download all of the tweets around any hashtag into Excel if you prefer a desktop version. Naturally, you’ll have to create new archives manually each week. Here are a few more ways to export Twitter search results into Excel or Google Spreadsheet. Quick tip: for all of the tools above, consider filtering out retweets to remove the clutter. Each Twitter chat will be a great resource for useful information and tips on a topic relevant to your business. It makes perfect sense to make the most of this content by repurposing it into blog content. This allows you to both update your blog regularly with useful relevant content and spread the word about your Twitter chat. So once your weekly Twitter chat is over, be sure to create a well-organized summary of the chat and post it to your blog with your official hashtag in the title (to make sure all of the retweets of your chat summary end up in the Twitter chat room). Include your official hashtag in the post title for it to end up in the Twitter chat. Your Twitter chat will grow from week to week. It will take time for your tweet chat to become “popular”. Give it some time and track your progress. For both of the above tasks, Martin Hawksey’s Twitter Archiving Google Spreadsheet is simply invaluable. It may take some time to set up (I described the whole process here) and you will also have to remember to run it weekly to update the archive. The outcome is well worth the effort! The spreadsheet will also collect all possible details about the chat participants (you’ll need to create a simple Twitter application for that) and identify most influential and best-networked participants. 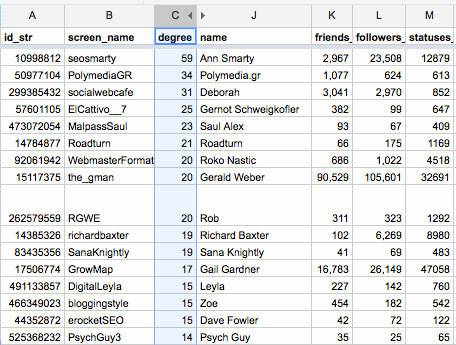 The spreadsheet is sorted by “degree” column, which stands for how many connections this user has with other tweeps from your spreadsheet (people the user follows + people who follow the user = degree). The higher the degree, the more connected the user is! 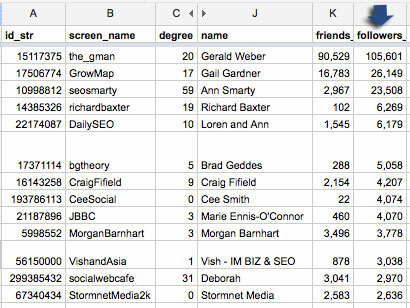 The spreadsheet is sorted by “followers,” which lets you identify the most influential users participating in your chat. Obviously, by tracking the influencers and active participants, you’re able to encourage them (for example, give away some prizes or invite them to moderate the chat) and thus motivate the whole community to get active as well! Other easier to use, but more basic, options to analyze your Twitter chat progress are The Archivist and WhatTheHashtag. Involve the Influencers: RavenTools.com hosts a monthly Twitter chat (#RavenChat) and invites a well-known influencer in the search industry each time. This is a great way to encourage niche influencers to start talking about you and engage their followers. Let Followers Self-Promote: It’s a well-known trick that if you want to turn your followers into brand advocates, help them promote themselves. #CommentHour is a great example of that: it lets bloggers visit each others’ blogs and exchange comments. The result is more traffic and networking contacts! #CommentHour lets bloggers promote themselves by promoting each other. Become the Source: Sometimes you don’t need a fixed topic and a fixed schedule. The best example of this is #JournChat which fosters an ongoing information exchange among search and social marketers, bloggers and journalists. 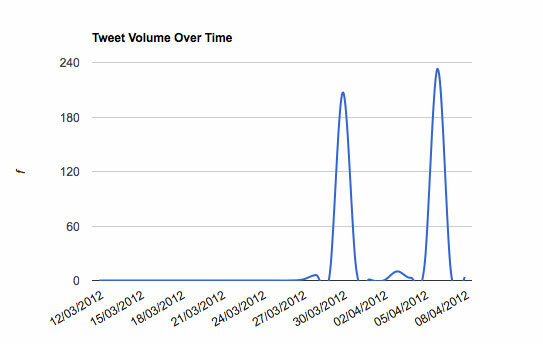 Since participating in #JournChat has become a great way to be heard, it has lots of tweets daily! #JournChat has grown into an ongoing discussion.